Indicator-CPUfreq is a modification of previous CPU speed switching applet comes with Ubuntu 10.10 and older. 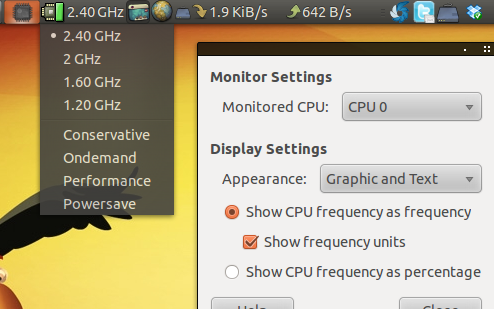 The applet written by Артём Попов can be used in Ubuntu 11.04 to change and monitor CPU speed due to Gnome panel will be going away. The applet provides 4 modes: Conservative, Ondemand, Performance, and Powersave. It is useful especially for Ubuntu Laptop to delay the use of battery while working outside. Alternatively, click following link to choose the latest indicator-cpufreq and download an appropriate package in its drop-down menu. After installation, press Alt+F2 and type “indicator-cpufreq” to launch the applet, you can also make it launch at every log-in by adding it to System>Preferences>Startup Applications. 13 users responded in " Change and Monitor CPU Frequency Scaling in Ubuntu 11.04 with Indicator-cpufreq "
What’s the name of that network monitor showing upload and download bandwidth? This is a great app, but i was just wandering in the case of having a quadcore cpu. How do i know if the speed i select is going to be the speed of each core? Hi. I am using the CPU frequency scaling monitor, Though my system is a dual core 1.07 mhz system. It only will scale to 800 mhz, which I would like more agressive scaling. is there a way to do that? I am using 10.10. I switch back from 11.04 I didn’t like it. you can right click the applet and select the processor core and set each core individually to a desired speed. I believe you have to edit the app for that. Do you mean the lowest setting is 800mHz? And what do you mean by more aggressive scaling? How do you get into the preferences? I don’t have an option for that. It only shows in my indicator applet with the same options as the “CPU frequency scaling monitor” applet (I don’t see any difference actually, so why should I install this one instead of the default applet?). can we set the cpu speed to it’s minimum speed at startup? I also couldn’t find how to get into preferences. I want to display the frequency on side of icon, but found no way to do that. It only allows me to change frequency and governor, no preferences. My indicator-cpu only controls core0 of my AMD64 system. The original gnome cpu indicators (v2.32.1.1) didn’t work at first in ubuntu classic mode until I removed cpufreqd which I installed earlier. Even as,I will still accept of noob, I don’t see how this would make a differance. Thanks for all, i used notebook hardware control in windows, because my battery is almost dead, and now it works also in ubuntu! thank you! !